One of my family’s favorite things to do it watch movies. One of our favorite movies to watch has to be Despicable Me movies and all those awesome Minions. We just can’t get enough, seriously. 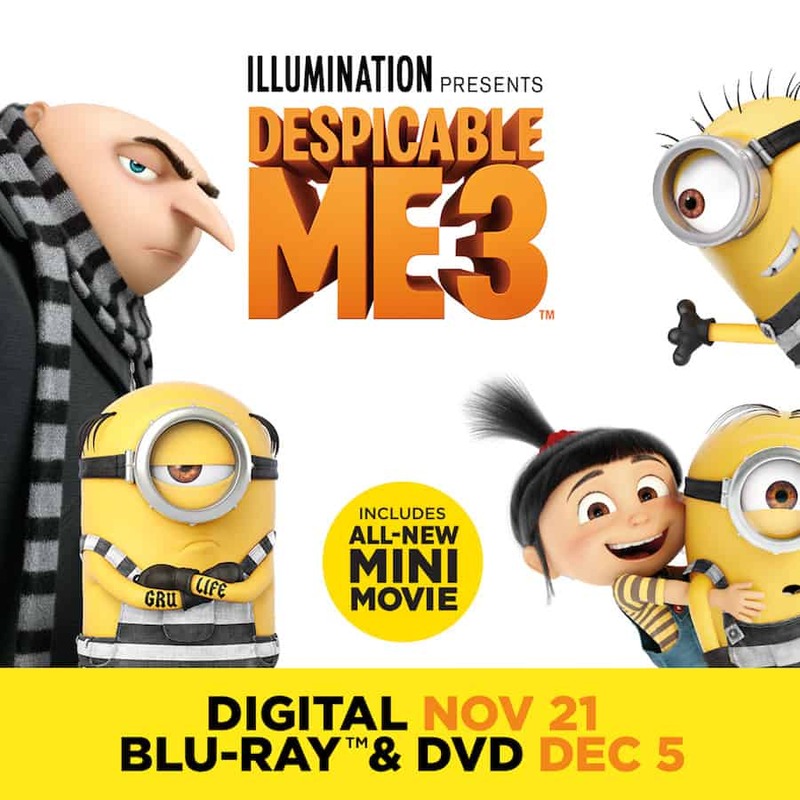 Now that Despicable Me 3 Special Edition is coming out Digital November 21st & Blu-ray and DVD December 5th, we just can’t wait to have movie night! These are just good, clean, fun, family movies that you just can’t help but enjoying. It’s silly, it’s cute, it’s warm, and it’s light hearted. It’s perfect really, especially when you have 3 kids that you want to spend good, quality time with. Illumination, the studio that brought you Sing, The Secret Life of Pets and Despicable Me, continues the adventures of Gru and his family in Despicable Me 3. After he is fired from the Anti-Villain League for failing to take down Balthazar Bratt, the latest evil mastermind to threaten humanity, Gru finds himself in the midst of a major identity crisis. But when a mysterious stranger shows up to inform Gru that he has a long-lost twin brother — a brother who desperately wishes to follow in his twin’s despicable footsteps — the former super-villain rediscovers just how good it feels to be bad. We saw it in the movie theater and it’s great. You will love it too. I had to share the trailer with you…in case you didn’t see and probably even more if you did! I love this movie, man. I really did. The characters beloved by everyone – Gru, his wife Lucy, their three adorable daughters—Margo, Edith and Agnes—and the Minions provide hours of family fun in this heartwarming comedy. Of course, it helps that the cast it always amazing! These movies attract the best of the best, and it shows every time! The movies stars Steve Carell, Kristen Wiig, Trey Parker, Miranda Cosgrove, Dana Gaier, Nev Scharrel, Steve Coogan, Jenny Slate and Julie Andrews. Hashtag awesome. Dude! Christmas is coming! All of the holidays are just around the corner. This is the PERFECT gift for anyone that loves to laugh and have a good time!! It’s the #1 animated comedy of the year, man. Despicable Me 3 is the ultimate holiday gift, with almost an entire hour of exclusive bonus features including an all-new mini-movie, Minion moments, and much more! Time to be a Hero: PJ Masks Season 1 is now streaming on Netflix!!! Kmart Is The Spot For Back-To-School Shopping!! This movie was so good! We’re all obsessed with Despicable Me 3. The entire franchise is so much fun! I love the Minions so much! I loved this movie when we saw it at the drive in over the summer. This movie looks like so much fun. The minions remind me of my kids when they were small. This will be an awesome movie for us to watch as a family. We really enjoyed the first two movies and we haven’t seen this yet. This sounds so fun! My son will love to see this! We all LOVED this movie so much. I’m glad it’s finally coming out on Blu-Ray. I can’t wait to add it to our collection. My 5 yr old cousin has always been a fan of Despicable Me series. Of course she is a fan of the minions! You’re absolutely right! It is the perfect gift for families this Christmas! It’s one of the movies that they’ll enjoy, without a doubt. It’s so nice to know it now has a DVD. We have not seen the latest in this franchise. We love the movies so much. I need to get on the ball! We love all the Despicable Me movies and can’t wait to see this one. It looks like a good one! Awesome to know that a DVD is finally out! My boys absolutely love this movie and it would be so nice to get this for them so they can watch it any time they please. I really want to see this. I loved Minions so I am sure that I will be checking this one out soon, too. I am SO excited this is out. The kids are going to LOVE when I walk in the door with it. Thanks for giving me a heads up on the release date for the Blu Ray copy of Despicable Me #. My grandchildren would love to watch this over and over again.